These strong closed-cell EVA tiles offer a warm, cushioned, non-slip surface. They link together to give any combination of design or area, and can be laid on soft or hard surfaces. The material is exceptionally hardwearing, rot-proof and UV stabilised, with holes to allow grass to continue growing. The Kampa Easy Lock Flooring is perfectly suited for Pathways, Gazebo Flooring, Caravan Awnings, Tent Flooring, Marquees, Pool Surrounds, Emergency Flooring, Children’s Play Area, Garden Sheds, Greenhouses, Sports/gym Flooring, Boot/ski Room etc. Brought these for outside caravan door but also use them in garden. Fantastic for kids to stand on while taking shoes off by trampoline. 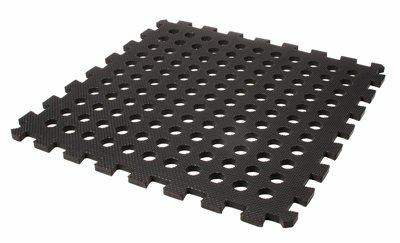 Much cheaper and more versatile than other matting. i bought this to use in the outer tent when camping but put them to use in the snowey weather at home.brill product.